We’re a Grass Roots Alliance To Prevent Expanded And Needless Draw Downs of Our Precious Lake Resource. What is today’s lake level on Pend Oreille? Check water levels at a glance here at this official link from the NW River Forecast Center, courtesy of the Lake Pend Oreille Alliance. STATE AND FEDERAL LAWS GUARANTEE A 2062.5 FOOT 6-MONTH LAKE LEVEL ON PEND OREILLE FOR ECONOMIC AND RECREATIONAL PURPOSES. The BPA and COE have reduced this to as little as a month and a half at 2062.5’. The BPA claims “cooler water” is needed earlier in the season below Albeni Dam to introduce bull trout to the lower Pend Oreille River. What is the real reason behind this attempt to drop the lake level? 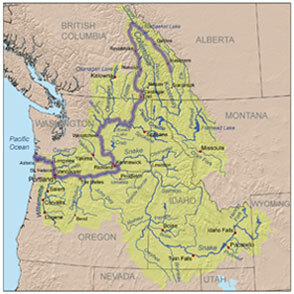 What role is the Kalispel Tribe playing in this water grab? 1. Stabilization of Lake Pend Oreille’s Lake level at 2062.5 feet during the 6 month period as guaranteed by law. This will enable Idaho citizens and the communities surrounding the lake to enjoy the full peak season recreational and economic benefits as outlined in Senate Document #9. 2. Representation by the citizens of Idaho and the users of Lake Pend Oreille in all matters concerning drawdown of the lake. Currently, the three entities that have put themselves in charge of determining Pend Oreille lake drawdown dates, amounts, and lengths are the Army Corps of Engineers, Bonneville Power Administration, and the Kalispell Tribe. 3. Control of the Albeni Falls Dam, and all proceeds from the power generated there, be turned over to the citizens of the State of Idaho, as guaranteed by Senate Document #9. That document decreed that once the Albeni Falls Dam had paid for its initial construction costs, all future proceeds from power generation, and control of the dam’s operation, would be returned to the citizens upstream from the dam. 4. Prevent the sending of water from Lake Pend Oreille, as well as Lake Coeur d’Alene and Priest Lake, through the existing U.S. dam and waterway system, for use by other states for any economic, agricultural or recreational reason. 5. Protect all facets of the recreational and economic benefits that Lake Pend Oreille provides for the citizens of Idaho, and prevent damage to our natural resources and way of life by outside entities. NOTICE OF PEND OREILLE LAKE COMMISSION MEETING JUNE 24TH. 2. Representation by the citizens of Idaho and the users of Lake Pend Oreille in all matters concerning drawdown of the lake. 3. RE-GAIN OUR LEGALLY GRANTED CITIZEN'S INPUT INTO THE MANAGEMENT OF THE ALBENI FALLS DAM, AND OBTAIN ALL LEGALLY GRANTED PAST AND FUTURE PROCEEDS FROM THE POWER GENERATED THERE. We seek our involvement in the control and management of the Albeni Falls Dam and our right to past and future proceeds as decreed in the minutes of President Truman's Interstate Water Compact. It states that once the Albeni Falls Dam had paid for its initial construction costs, all future proceeds from power generation, and control of the dam's operation, would be returned to the citizens upstream from the dam. 4. PROTECT ALL FACETS OF THE SCENIC, RECREATIONAL AND ECONOMIC BENEFITS that Lake Pend Oreille provides for the citizens and communities of Idaho located upstream from the Albeni Falls Dam. Volunteer your time and skills by becoming a  member of the Lake Pend Oreille Alliance. Talk to everyone you know asking them to support this important initiative. Place a yard sign at your home. North Idaho Water Rights Threatened!